Root here, but most of the React code is in ui.jsx and StatusBox.jsx. The server code just implements a REST-like interface in Go language. Health Monitor. The /detail/ page uses React. Compare it to the home/list page which uses handlebars for rendering. It’s hard to tell if that’s even well formed, let alone correct. Listed below are a few pros and cons I’ve gleaned along the way. Client-side Model/state management. They say it’s the “V in MVC” but I find its real strength is in how it maintains a proper model. Typically I’d just map json to input boxes and pull them out at the right time. 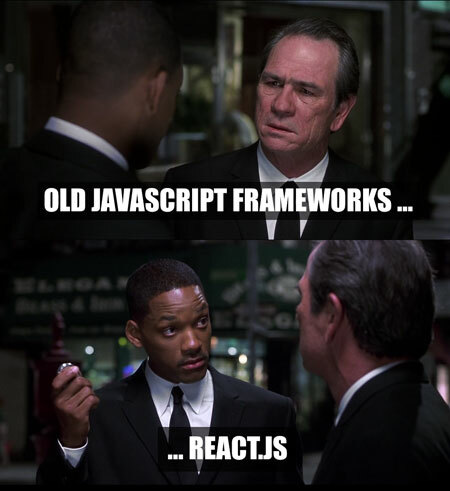 React enforces an internal state, and each change is reflected in that state. When the user is ready to commit a form, there’s no giant method extracting and converting data as the model is current in state. Occupies the sweet-spot between functionality and shallow learning curve. It’s bite size enough to allow the developer to convert their code over in steps, testing it along the way, but carries enough features and structure to encourage the developer to create powerful and modular components. Documentation is pretty darn good about walking you through a typical design scenario. Lends itself to iterative refactoring. As I was developing, it was easy to see when a couple elements had outgrown their space and could be pulled into their own component or group. 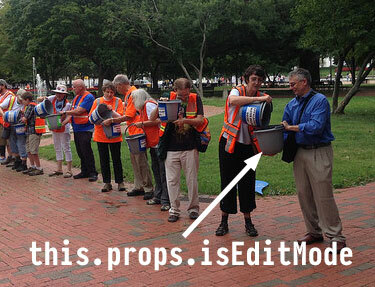 Passing a function down the parent-child chain feels like a bucket brigade. Everyone gets their hands on it, only the last guy uses it. External event interaction. I couldn’t find a way to fire React’s SyntheticEvent in a way that bubbles up to parents. The datetimepicker fires its own change event dp.change; how do I notify an ancestor React element levels away to update the model? These points are taken from my limited experience in this particular domain. Different scenarios may invalidate some of this, YMMV. Use React.addon.update to update state. It makes it easier to add a new object to state without having to preserve it explicitly in every this.setState(). The query syntax for partial updating is pretty neat. Steps 2-4 incur a delay resulting in a brief flash of the 1st UI rendering, followed by a post-AJAX redraw. I use a PageBusy flag in state here to suppress the first render until data comes back. A typical Code Jam problem requires at least 2 solution submissions: a small set and a large set. Expect the large set to have more test cases, larger inputs, and an 8 minute time limit. Normally, this means that the brute force algorithm you wrote for the small set is useless on the large set. After porting the O(N) simplistic summing solution over from Rust and utilizing only one core, 1000 large test cases ran in 1280s. In the large set, there are a total of 6000 cases, 4000 of which involve large numbers, so roughly speaking, this solution would take 1 hour and 25 minutes. One of Go’s main features is its very simple parallelization via channels and goroutines. Goroutines let us fan-out our solver to multiple threads. Channels help us fan-in their responses to a single array in a threadsafe manner. Executing this brought us to 83 seconds: a 15x improvment. Not bad. There’s a limit to how much scaling can be done on a single machine, so our next step is to use a cluster. If we divide the test cases out to 2 machines, theoretically, we should cut that time in half. // Establish TCP connection to node. // Send batch of inputs. // Wait for results and unpack. // Send results 1 at a time through the channel. // Create a channel for results to be returned to. // Execute solution on the inputs. // Gather channel results into Result slice. Ignore order for now. // Send back the result batch. And finally, all 6000 cases of the large set executed in 43.38s. This is lower than the 4096 cases tested because for those tests I was repeating a single case which was perhaps more complex on average than the cases in the large set. Allow some tolerance for TCP delays using timeouts and retries. Improve load balancing by dividing batches into smaller chunks. When a node becomes available, send it a new batch. Provide failover. If one node refuses to connect, or if it doesn’t return its results within the expected time, strike it and give its work to another node. Create logging for debugging remote node. General error handling; currently, nothing is checked. This was merely a POC to mess around with Go’s concurrency mechanisms, but for those of you who need just that extra edge, the code is up on github: clusterjam.go. Problem 1A in Code Jam 2013 involved finding the maximum number of rings that could be drawn when creating an archery target; the starting radius r and paint supply t vary. // Any bigger than this is overflow. The good news was that the solution was constant time, O(1). The bad news was computation, debugging and BigInt wrangling ate up too much time so I failed to submit before the contest ended. // Double the ring size till we surpass total paint. // Answer now bounded between low/high. Binary search. Given the time constraints in Code Jam, sometimes it’s difficult to stop and guage what’s going to be fast enough. Then again, I should be able to adapt binary search into any solution fast enough by now, that a quick check shouldn’t cost much more than a few minutes. The more important point here is that libraries that rely on socket can now be used. Indeed, the App Engine team has provided a demo that uses “nntplib”. A question on Reddit spurred my curiousity and gave me a chance to try out Amazon EC2 for the first time. This is a small proof-of-concept that demonstrates accessing a remote Redis instance hosted on EC2 from App Engine. This section is a dump of my notes from setting up EC2. Skip this if you already have a Redis server. Navigate to the Amazon EC2 console Dashboard and click “Launch Instance”. Go with the “Classic Wizard” and choose a server. I used “Ubuntu Server 12.04.1 LTS, 64-bit”. For most of the way, I stuck to the defaults, so you’ll end up with a “T1 Micro (t1.micro)” instance type. Blow through the Launch Instances, Advance Instance Options, Storage Device Conf screens. Give a value to the Name key tag if you wish; I skipped. You’ll have the option to choose an existing Key-Pair if you’ve done this before. If not, Create a new one by giving it a name and click “Create & Download your Key Pair”. Keep track of that downloaded file; you won’t get another opportunity to download it. In fact, go ahead and copy it to the ~/.ssh folder of the machine you’ll be connecting from. Next “Create a new Security Group” if you don’t already have one and give it a name and description. In the “Create a new rule” dropdown, select SSH and click “Add Rule”, so you can admin the box. Permissions 0664 for '/home/xhroot/.ssh/ec2_redis_keypair.pem' are too open. It was on line 30 for me. Use 30Gi#, hit ESC, ZZ. redis 127.0.0.1:6379> set igor "IT WORKS!" I had a Redis client installed on a local Windows machine so I thought I’d mix it up by connecting from there. Congratulations! You are the proud owner of a public, wide open, credential-free Redis instance. Fortunately, this article is merely a POC so we’ll be driving blindly past red flags for now. It’s not necessary to deploy this app to test it; the dev_appserver works fine. If you choose to deploy, note that “Sockets are available only for paid apps.” Create a new App Engine application and enable billing in the dashboard now to allow for the 15 minute delay before billing is active. That’s it. Perhaps the main driver for having an external caching layer as opposed to using memcache is to have greater control over data eviction. Another reason might be that a distributed cache may be suitable for synchronizing across platforms. It’s always nice to have choices and to see more capabilities being added to this platform. Looking forward to seeing what’s new in the I/O release. For Google App Engine developers this is implemented by the Channel API. There are also third party services like Pusher and Beaconpush that provide this capability through their API. 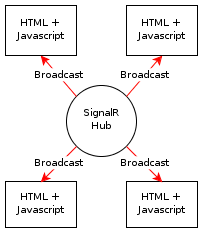 And recently, thanks to David Fowler and Damian Edwards, .NET developers can also integrate this technology into their projects using SignalR. I’ve cooked up a small demo that uses SignalR to demonstrate one solution to the problem of conflicting updates. 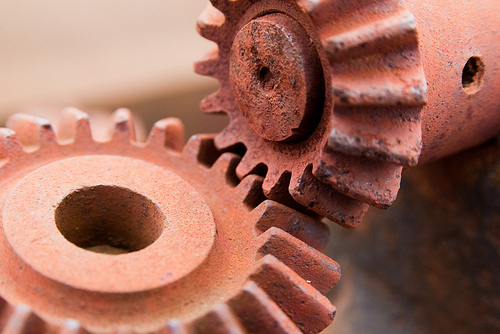 When multiple users act on the same set of information, it’s easy for it to get out of sync. This demo uses SignalR’s Hub to push updates to the users the moment they occur so they can immediately act on the changes. Our application is a student registry form. Users can update a student’s name, GPA and enrollment status. A server section, visible only for demo purposes, shows us the state of the database. Because the most recent data is always pushed to the browser, we can take immediate action instead of discovering a save conflict at the end of a long form. Shown right is your typical N-tier MVC stack. Browser requests are handled by the controller, data is passed to the service for the real legwork, the DB is consulted as necessary and the data is passed back up the chain to the browser. Fantastic. 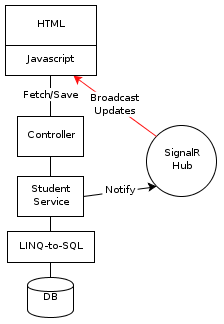 Where SignalR comes into play is when the StudentService decides a legitimate update has taken place. It then notifies the Hub that a new update has occurred and it should broadcast the new record to all listening browsers. Let’s take a look at the setup. // Start hub; load clientId when started. // Define the callback that allows the server to send data. Recall the video demo above. When the student is saved, all other browsers immediately show a dialog notifying them that an update recently occurred with the option to accept the recent changes. Note also that the browser that issues the save will receive an updated record from both the Ajax save response and the StudentHub. We use the ClientId to check for the identity of the sender and ignore the duplicate update when the client id is self. Now, concurrency violations will only detected at save time. I’ve built this example as an MVC project, but Webforms could be used as well and I’ve included a WCF service as an example. To use it, in the Index.cshtml view, change the serviceUrl ternary to true. Very responsive UX. Events can be reported within milliseconds of a database save. Allows interaction with other connected clients (e.g., customer service chat). Can be added to existing projects. Introduces some complexity in the code, especially on the client side. More states to keep track of. The source for this demo is available on github: Registry. Koderank is an online whiteboard that provides an environment for quick and easy coding interviews. Interviewers can give candidates small coding exercises to gauge their abilities, and can view the code live as it is being typed. Voice chat is available through Twilio Client to allow the interviewer and candidate to converse during the session. I originally created it for the Twilio Client launch contest and it was selected as one of five winning entries. The first iteration was done in Python/jQuery. 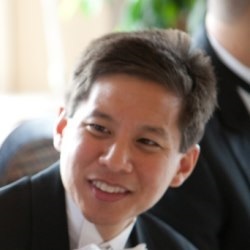 As a learning exercise, I reimplemented it in Go language and Closure Library. Twilio Client Capability. Used for creating and packaging scope definitions. I ported some functions over from John Sheehan’s C# project. Base 62 UUID’s. This is based off a suggestion by Russ Cox for creating simple UUID’s. For URL compression, I wrote a method that converts it to base 62. It requires the math/big package to convert the 32 character hexadecimal number into a 23 character base 62 string. Sometimes it’s nice not to have to write everything yourself, though. Kudos to the developers of the third party libraries that I used such as Diff-Match-Patch, CodeMirror, and GoJWT. They’re credited on the About page. In the same spirit, I’m opening the source to the Koderank website which you can now find on github: Koderank source. It runs on App Engine and uses the Channel API for sending data to the listening browser. The server and client-side are written in Go and Closure Library, respectively. I’ve written previously about my experiences with Go and Closure. Declaration is very concise. := is used as declaration + assignment. var and a type are necessary if there is no assignment (and thus no type to infer from). Multiple assignment. This is not unique to Go, but it highlights what is so attractive about it: you can compose code in a way that is so natural that others find it easy to read. How do you swap 2 integers in C#? More importantly, multiple variables can be returned from a function. This eliminates having to create transport objects whose only purpose is to wrap multiple values. Implicit interfaces. Implement an interface without having to declare it. Strict compiler. Does not compile if imports or variables are unused, which has prevented many bugs. So much is caught by the compiler that I’ve been pleasantly surprised by how frequently I’ve gotten past compilation and the program ran without errors. Slices. 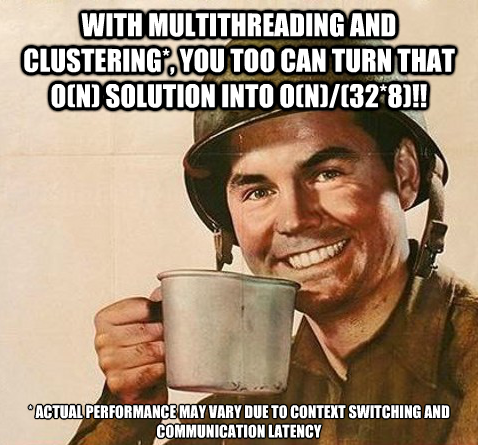 Think of them as sub-array pointers. Error handling. Idiomatic Go encourages always checking for errors as soon as they may occur or be returned. If you use guard statements often, you’ll probably be OK with this style of coding. Here’s a list of some great resources for learning Go: Go Resources. Copyright (c) 2012, Antonio Rodriguez. All rights reserved. DO NOT ALTER OR REMOVE COPYRIGHT NOTICES OR THIS FILE HEADER. version 2 for more details. information or have any questions. DIFFRINT FROMINDEX AN SMALLR OF FROMINDEX AN TOINDEX, O RLY? DIFFRINT FROMINDEX AN BIGGR OF FROMINDEX AN 0, O RLY? DIFFRINT TOINDEX AN SMALLR OF TOINDEX AN ARRAYLEN, O RLY? This code can be compiled with Justin Meza’s lci LOLCODE interpreter. For the Java implementation, refer to line 919 of TimSort.java. I competed in Google Code Jam for the first time this year and really had fun with it. Some of the puzzles can seem challenging at first glance but usually break down into a main algorithm with a few checks for outliers and limits. It’s a pretty good test of how quickly you can translate a problem into code. I used C++ primarily and Go language in one case since I knew it had a handy string.Map function. My solutions can be found on github. One of the problems, named Kingdom Rush, provided a game scenario as input and required a result indicating the shortest number of turns to complete it. Search for any eligible 2-star ratings. If found, mark it done, update score, and start over. If none found, search for any eligible 1-star ratings. It passed the given samples, so I submitted and it failed. The grader doesn’t say why or give errors, so I had to find a case that broke the code. This is where pencil and paper are invaluable since at this point you have to simulate instances. Turns out, you can shorten your game by doing 2-star ratings where the 1-star rating is unlikely to be completed until late. I resubmitted with this modification and it passed. Have a pencil and paper handy; this is largely a math contest. Doodling tends to provide insight. As I was working on Hall of Mirrors my sketch reminded me of the Fly and Spider problem, which revealed a very reasonable approach. Hurry. Readability and elegance are for teams and longevity; this is an intense individual exercise where you only need 1 good run. Write the quickest thing that might work. Remember any initial assumptions. In this problem, I assumed that order did not matter. When the solution I had coded worked exactly as intended, but was still wrong, it took me valuable minutes to work back and realize that turns could be minimized with a deliberate selection order. Don’t mistake this for advice about not making assumptions; you should (see “Hurry”). Just remember what you glossed over when things don’t work. Break it down. The idea behind this is trite, yet why do large problems always daunt us as if they were monoliths that can only be tackled in one piece? While not being gimmicky, these problems often break down into known solveable chunks. At its core is usually something familiar. cmd /k - This opens a command session, executes the command that follows, and keeps the window open. Useful if you’re entering commands in a Run dialog; unnecessary if you already have an active command prompt. wevtutil - Windows event log read utility. System - … specifically from the system event logs. /q:"..." - XPath-like query used to traverse the XML. /rd:true - Direction, “true” shows latest first. /c:1 - Number of results to return. /f:text - Format output as text, which is fairly readable in this case. Could also opt for “XML”. This simply returns the last event with a source name of ‘Microsoft-Windows-Power-Troubleshooter’. Skim through the result to verify that it’s a return from sleep event. If not, increase the number of results to return using the /c parameter. This can also be accessed via the GUI using Start -> Run -> eventvwr -> Windows Logs -> System -> Find -> “Microsoft-Windows-Power-Troubleshooter”. I’ve found this command useful in consulting situations where I need to track time for billing purposes.